This page provides a summary of research results for the Cleveland Plain Dealer’s photographic coverage of the 2012 presidential election. The Plain Dealer heavily featured the pivotal debate performances of the two candidates. Puzzling, however, was why there were so few photos of the candidates’ visits to swing states like Ohio. The utter dominance of photos from the debates meant that viewers could get little (visual) sense of the candidates beyond their debate performances — there were, however, slightly more photos of Obama with his supporters. These six images of Barack Obama and Mitt Romney are a sampling of photos published by the Cleveland Plain Dealer during the three weeks of the PrezPix study. Clicking a photo links to the Pinterest board of that photo. Researchers pinned a total of 260 photos from the Cleveland Plain Dealer over the three weeks of the general election — 144 photos of Pres. Obama and 116 photos of Gov. Romney. Across the three weeks, the Cleveland Plain Dealer published* almost 25 percent more photographs of Obama. The greatest number of photographs of each man dated from the presidential debates, but the Plain Dealer published* more coverage of Obama campaigning in between the debates. 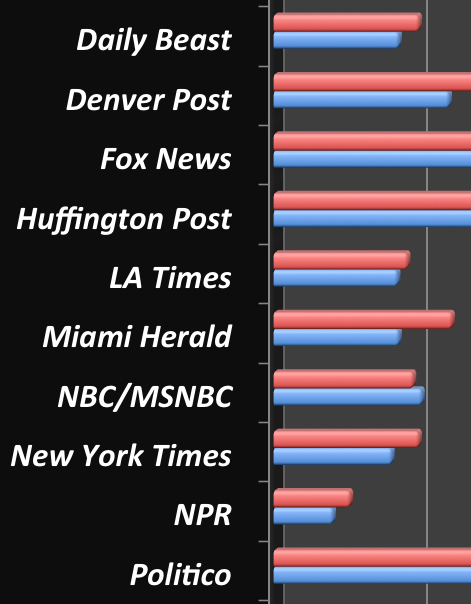 Unlike most of the other 18 news outlets evaluated during the general election, the Plain Dealer never published photos that researchers coded as “very negative.” For both of the candidates, “postive” and “neutral” (at times relatively generic) images predominated. The Cleveland Plain Dealer integrated well with Pinterest; even images from photo galleries pinned with no difficulty. Much of the Plain Dealer‘s coverage of the campaign came from the Associated Press, but AP articles rarely appeared with photos. Articles written by Plain Dealer reporters did include photos (often from their own photographers), but most photos were pinned from photo galleries. 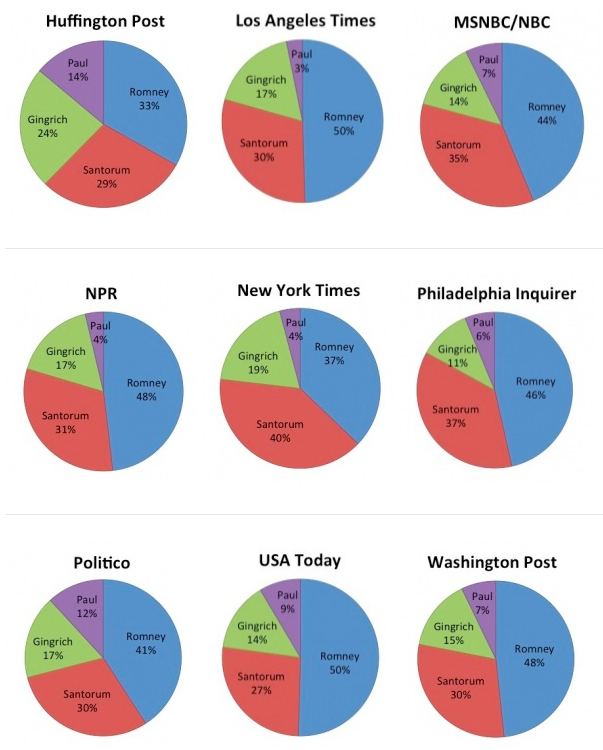 These six pie charts show the percentage of positive — neutral — negative photos of Barack Obama and Mitt Romney from the Cleveland Plain Dealer coded by researchers during the three weeks of the PrezPix study. Sept. 17-23 —The Cleveland Plain Dealer published very few photographs of either candidate two weeks before the first debate, but of those that did appear researchers coded a roughly equal percentage of “positive” photos for both Obama and Romney . Oct. 1-7 — The Plain Dealer published significantly more photographs of the candidates the week of the first debate — overwhemingly taken during the debate itself. 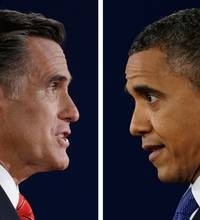 Researchers coded a majority of the debate photographs as “neutral” in tone for both men, although they did note some “negative” images of Obama. Oct. 15-21 — The week of the second debate, the Cleveland Plain Dealer published “positive” photos of Obama nearly half of the time. Researchers coded roughly equal percentages of “positive,” “negative” and “neutral” photos of Romney during that week. Cleveland.com had two sections that covered the 2012 presidential election season: its “Politics & Elections” section and a special “OPEN (Ohio Politics & Election News) Blog.” The Plain Dealer picked up many of AP’s articles about the candidates, and these did not include photographs. Most of the Plain Dealer‘s own stories had medium-sized photos, but they also had large photos on a photo gallery page. There were no videos to pin from the Plain Dealer. PINTEREST: It was very easy to pin images from Cleveland.com because there were not many extraneous images, like ads or thumbnails, that popped up when trying to pin a story’s photo. Thumbnails from the home page were not typically pinned. CONTEXT: Cleveland.com is the online version of Ohio’s largest newspaper the Cleveland Plain Dealer. The “real-time” website covers local news stories, sports, entertainment, politics and business in northeast Ohio, as well as national news. Cleveland.com also includes stories from Sun News, a conglomerate of 11 hyper-local newspapers in Northeast Ohio. It attracts 5 million unique users each month, according to its media kit. Both the Plain Dealer and Sun News are owned by Advance Publications, which also owns Condé Nast magazines.